This viewpoint of Barks’ ducks seems very narrow to me, Jeet. The Ducks were some of the most well rounded characters in kids comics at the time… which is probably the biggest reason why they were so successful. While the ducks were certainly capable of greed, malice and avarice… they were also capable of affection, generosity and heroism. So I don’t really understand an interpretation that paints them as flat and one-dimensional as Little Dot or Richie Rich. If this is your viewpoint of them, I suggest you read more Barks! Check out almost any of his many Christmas stories for some good examples. While there are certainly some dark themes in Barks’ comics, implying an overarching darkness to them seems absurd to me in the extreme. The Barks that wrote the duck stories was most likely a very different man from the Barks you quote from shortly before his death. My understanding is that his later years were a very dark time for him with the loss of his wife and some exceedingly unscrupulous business handlers. I don’t see this degree of bitterness in his stories at all. Dumbo’s Sky Voyage is not the best comic on the list below… heck, it isn’t even close to being the best issue of Dell’s Four Color series on the list below (I mean, Carl Barks classic tales Lost in the Andes and Voodoo Hoodoo are down there! It doesn’t get any better than that! Why am I talking about Dumbo?). I speak to you about it solely because I read my copy of it to my daughter the other week. Even bad issues of Four Color (and this is a pretty bad one) are pretty entertaining. 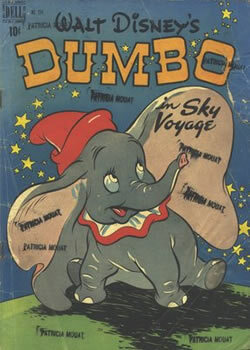 Dumbo is one of my favorite Disney cartoons, but this doesn’t preserve much of its charm. Dumbo talks in this comic (he’s silent in the movie), and his entertaining sidekick Timothy the Mouse is nowhere to be seen. Strangely, although Timothy and all other characters from Dumbo are completely absent, Doc from the Seven Dwarfs shows up (tangent: why is it dwarfs instead of dwarves when these imps are mentioned, anyhow? )… all Disney characters apparently living in the same shared Disneyverse. 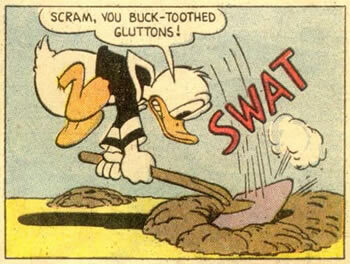 Needless to say, continuity was never a concern in the old Disney comics (at least not until Don Rosa’s excellent take on the Disney ducks). I think there was at least one other random Disney character that showed up somewhere in it… damned if I can remember at this point, and it takes too long to download and find out. My memory is lousy anyhow, and this is not a memorable comic. Kind of fun, though, and I’m a sucker for about any issue of Four Color. So, I liked it. But I can’t really recommend it! Maybe you just like old Dell comics like I do… you can download it by clicking the image above. Don’t miss those Carl Barks comics, though! Square eggs!!! Jings! Crivens! and Help ma bob! It’s Oor Wullie! I Think These Are From Ziff Davis Comics Group. Look out for “The Big C”! Number 517 Graveyard of the Rocketeers! SFCC – collaborations: arm wrestling, dancing and more! Much like the Crosseyed Cyclops I mentioned yesterday, Cool-Mo-Dee has also posted a whole comics collection worth of great old comics. Recently they’ve been doing the world the great service of focusing on one of my favorite series of all time… which is also I believe the longest running (numerically) comic title of all time… Dell’s Four Color series. Dell licensed and published most of the popular highly recognizable children’s icons of the era that they were in business, and they had most of the best children’s cartoonists working for them (Barks, Kelly, Stanley, and many others) from the 30’s through the 60’s. I’m not sure how frequently Four Color came out (weekly? bi-monthly?) but the last issue was numbered #1354. It was not a conventional series featuring one character, but a long series of one shots featuring Dell’s huge library of popular licensed characters. 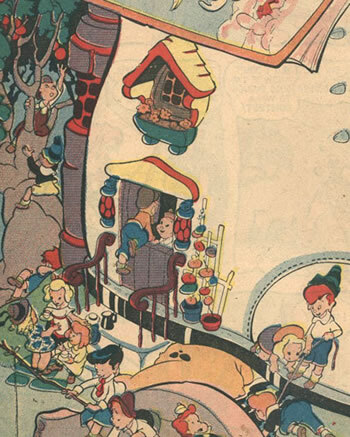 Four Color‘s run includes the first Donald Duck comic and the first Uncle Scrooge comic among other wonderful things… many of the greatest adventure tales of Carl Barks were Four Color one shots. Walt Kelly did a huge body of brilliant non-Pogo work for children in the Four Color books in a number of different titles. Titles that proved particularly popular were often spun off into their own series, so Four Color was very much a testing ground for Dell as well. The vast majority of the Four Color comics have never been reprinted and probably never will be. 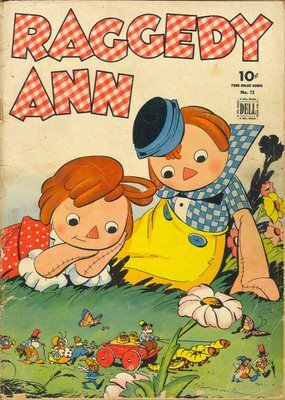 Pictured above is a typically charming cover to a typically charming issue of Raggedy Ann (Four Color #72), which you can download here. You can read more about the Four Color series on Wikipedia here. Hey! Hey! Here’s Some More Creepy Magazine For You…. Black and White Wednesday: Dave Sim’s Debut “The Cry of the White Wolf"
Three Strikes You’re In Wednesday Advertising Day. Carl Barks is best known for all his fantastic work on the Disney Duck comics, but he did other wonderful kids comics for Dell as well. Today, Cool-Mo-Dee brings us his one Porky Pig comic book, Porky of the Mounties, which was Four Color issue #48. 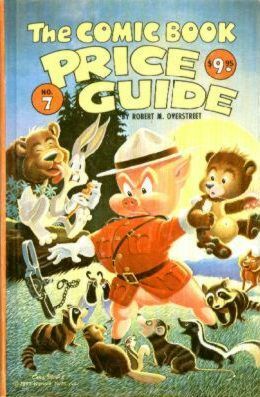 Pictured above is a small image of the Porky of the Mounties painting that Barks did for the cover of the 1977 Overstreet Comic Book Price Guide. Fun With Dead Animals — All Secrets Revealed! Because I Said So Tuesday Newspaper Strip Day. Mandrake’s Wedding Dailies 226, 227 & 228 in One Book!!! “The Good Duck Artist,” Carl Barks excelled at both short humor comics (his ten-pagers in Walt Disney’s Comics and Stories) and longer adventure stories… in fact he did both better than just about anyone else in comics at the time he worked (using the pseudonymn of “Walt Disney”). I have examples of both types of stories today… on the adventure side of things, Rodney Bowcock’s Comics and Stories brings us the Donald Duck classic The Gilded Man. 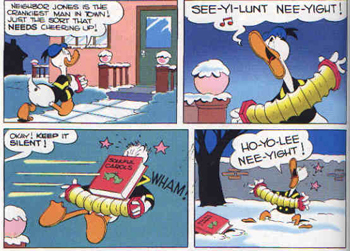 On the short humor strip side, courtesy of the Fortress of Fortitude we have Donald Duck in Silent Night, doing battle with his ongoing next-door nemesis in the 10-pagers, Neighbor Jones. Although drawn in 1945, this story was initially rejected for violence, and was not printed until decades later. Wicked Wilbert Monday Cartoon Day. This calls for another romance comic. Batwoman! Bat-Mite! Bathound! Together because you demanded it! from Blimey! It’s another blog about comics! GORKA GUDARI DE PALACIOS. ATISBOS DE POESÍA. Holiday Tales Bonus! Steve Ditko “On the Day of His Return"
Will You Still Love Them When They Are 54? Number 434 Turn on your ghost light! Moist, a Dr. Horrible Comic! More rare Opper strips from Allan Holtz at The Stripper’s Guide! 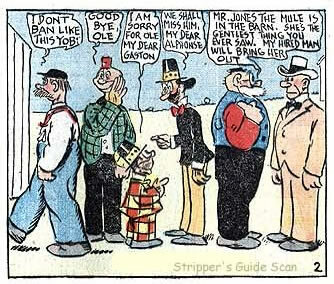 One particularly interesting item features most of Opper’s characters that were current at that time in one strip… a panel from it can be seen above. See the strips here and here. 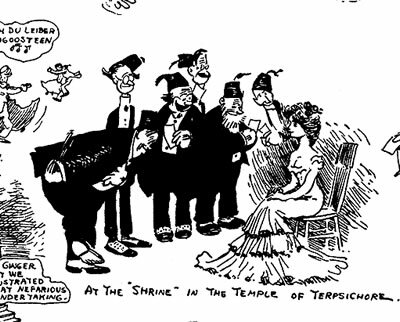 Also, another of Mr. Holtz’s wonderful Herriman Saturdays, reprinting some of George Herriman’s extremely rare early editorial cartooning work. This week includes more coverage of the previously mentioned Shriners’ convention. 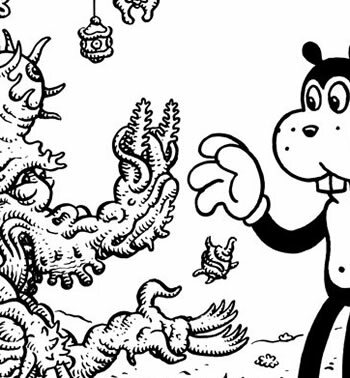 Another beautiful monstrosity from Jim Woodring. The Walt Disney’s Comics and Stories Donald Duck 8-pager Gopher Goof-Ups by Carl Barks courtesy of Rodney Bowcock’s Comics & Stories. A rare, beautifully drawn comic to sell kids shoes by Walt-Kelly-influenced animator Dave Tendlar courtesy of Cartoon Brew. Wouldn’t some CHARLES ADDAMS be good right now? Coo Coo In Viva Mexico! Journal 65: About Music 2. Page 21. Journal 65: About Music 2. Page 22. Journal 65: About Music 2. Page 23. The Head of the Family!